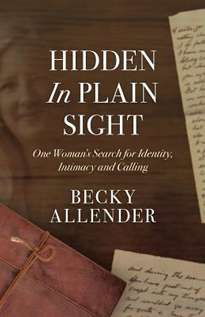 Becky Allender is the author of Hidden in Plain Sight: One Woman's Search for Identity, Intimacy and Calling (2017). In her memoir, Allender explores her journey stepping out from the shadow of her husband and fellow author, Dan Allender. Becky often felt 'hidden in plain sight' behind her more vocal partner. The book describes her successful effort to become visible through the power of remembering stories and embracing them with kindness. By offering care and intrigue to her experience it enabled her to gain new freedom to open her life and highlight the good, the bad and the memorable. Becky invites readers to ponder their stories and to prize the way God quietly reveals himself in the mundane and the magnificent parts of our story. This book is a must read for those who want to transform their lives and become visible in plain sight. Becky Allender and her husband Dan live on Bainbridge Island where they raised three children. They are members of Cross Sound Church and founders of the Allender Center at The Seattle School of Psychology and Theology in downtown Seattle. Becky Allender facilitates many of the story workshops the school puts on for those dealing with trauma and sexual abuse in their formative years.